Mmmmm, join us for a single malt whisky tasting and the traditional Burns night meal for haggis lovers. These are top, award winning whiskies that will be introduced by Michael Hopert from Royal Mile Whiskies. We'll sample them with cheese, plus you can book for an optional traditional Burns night meal. I can't wait! The tasting is at 18:30, dinner at 20.00. We will be running some super special Azerbaijan food events plus cooking and tasting demos sponsered by the Southbank BUTA festival of Azerbaijani Arts. Visit the demo tent for free tips on Christmas menus. 12.00 London artisan caterer Sarah Moore will demonstrate how to make Christmas canapes and still enjoy yourself! 16.00 begin: Taste the exotic. Azerbaijan! 20.00 finish: Taste the exotic. Azerbaijan! 13.00 London artisan caterer Sarah Moore will demonstrate how to make Christmas canapes and still enjoy yourself! 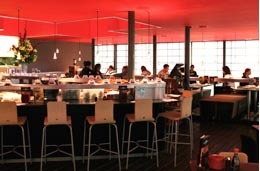 For sushi lovers - Moshi Moshi celebrates Terra Madre Day! 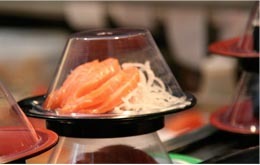 Here at Slow Food London we just heard about this great event for all you sushi fans on Thursday 10 December! Please join Moshi Moshi and show support for ethically sound fish by choosing one of the Terra Madre day Cornish Connection fish dishes, and they will donate £1 to Slow Food for each dish you eat! Terra Madre in 2004 brought together Caroline Bennett, founder and owner of Moshi Moshi, and Chris Bean, an inshore gill-net fishermen from Helford, Cornwall. The partnership has never looked back, and Caroline would like to take the opportunity on the 10th December to thank Terra Madre for introducing her to a whole new approach of dealing directly with sustainable fishermen. Since 2004, Chris has supplied Moshi Moshi with top-notch quality fish, that even a chef in Japan would find hard to beat! 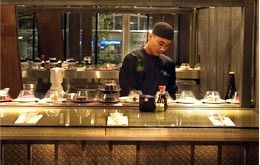 Our Japanese chefs when they saw the quality couldn't believe it was possible in the UK. We and our customers have benefitted hugely from receiving this wonderful fish, and in turn, Chris has benefitted from getting a steady price for his catch. So we have established the 'quality' and 'fair' pillars of Slow Food's code of conduct, but the third pillar 'clean' was the one that actually brought us together. We share the same belief in trading with as little harm to our planet as possible, and Chris fishes in a way that does the least damage to the marine environment, thereby ensuring that there will be plenty of fish for future generations. Waitrose, Canada Place, E14 5EW. Enjoy delicious Italian food and wine including Slow Food Presidia and organic food from Modena in Emilia Romagna, Italy, with chef Claudio Bincoletto at Banana Store on Monday 7 December. What are Slow Food Presidia? They are local projects that work to improve the infrastructure of artisan food production. The goals of the Presidia are to guarantee a viable future for traditional foods by stabilizing production techniques, establishing stringent production standards, and promoting local consumption. Price to be confirmed. Please call the restaurant to book. Taste the exotic this Saturday for £7. Azerbaijan! Slow Food London and the Buta Arts Festival are hosting a unique event: THE BUTA KITCHEN of Azerbaijani cooking in our demonstration tent on Saturday 19 December, 16:00 - 20:00. Enjoy the hospitality of Azerbaijani cooks, musicians and food producers in a grand display of their ancient & exotic Azerbaijani cuisine. This Terra Madre event is part of the worldwide celebration of food community networks. Also subsidised by BUTA, it's a mere 7 quid! Sample rare pomegranate and blackberry wine as well as shots of mulberry vodka. Watch Azeri women produce dolmas to a rhythm set by live drummers. Talks and live Azeri music all afternoon. Terra Madre is coordinated by the Slow Food organization. Entry £7 kindly subsidised by the BUTA festival!